(Nanowerk Spotlight) Along with graphene, atomically thin sheets and ribbons of boron nitride (often called "white graphene") have increasingly attracted fundamental research interest (see "The rise of white graphene"). While researchers make good progress on developing techniques for mass-producing graphene (see for instance: "Novel method can mass produce graphene"), it is still a challenge to reliably chemically delaminate and/or exfoliate boron nitride and to realize mass production of atomically thin sheets made of this material. Researchers in Japan have now reported a new approach for synthesizing boron nitride monolayers which pretty much works like blowing a balloon; although these balloons are sized in a range of tens of micrometers. The new technique solves the problem of low-throughput fabrication of 2D crystals. "We have developed a new route of chemical blowing for the production of atomically thin – one-to-few atomic layers – free-standing boron nitride and boron-nitrogen-hydrogen nanosheets," Xuebin Wang, a researcher at the International Center for Materials Nanoarchitectonics (MANA) and PhD student in Professor Yoshio Bando's Inorganic Nanostructured Materials Group, tells Nanowerk. "This technology has two main characteristic features: high volume yield and laterally large areas. These not only provide large enough flakes that are readily available for electrical and mechanical performance explorations, but also give enough nanosheet mass for fabricating ultimately strong polymeric or other composites." 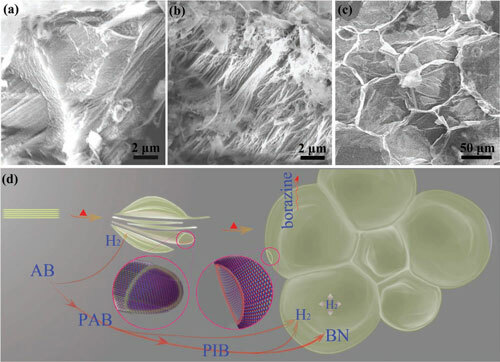 Describing their work in a recent edition of Advanced Materials ("'Chemical Blowing' of Thin-Walled Bubbles: High-Throughput Fabrication of Large-Area, Few-Layered BN and Cx-BN Nanosheets"), first-authored by Wang, a team from MANA and Waseda University produced mono- and few-layered BN or x-BN sheets with large lateral dimensions. The team started their fabrication process with a precursor ammonia borane compound. A multistage process of pyrolysis and dehydrogenation of this compound resulted in a boron-nitrogen-hydrogen (B-N-H) polymer made of densely packed bubbles. As they were blown – with the hydrogen gas that was released during the process from the precursor compound – the walls of the bubbles became ultra-thin, sometimes even as thin as a single-atomic layer. When the bubbles collapsed they left 2D boron nitride sheets. "Our method is completely new for growing 2D crystals, different from the previous methods, such as exfoliation 2D crystals from their bulks by taps, ultrasonic or chemical reaction, unwrapping their nanotubes and exactly depositing an atomic layer on a substrate," explains Wang. This novel method is catalyst-free and substrate-free, and simpler than a normal chemical vapor deposition (CVD) method. Its products, BN nanosheets, generally possess larger lateral dimensions (around 100 micrometers) than that from solution exfoliation. More importantly, the yield of this method is as high as 25 %; compared to for instance only 1% for the method of unwrapping nanotubes. Wang points out that the 'chemical blowing' technique not only provides large enough flakes that are readily available for electrical and mechanical performance explorations, but it also gives enough nanosheet mass for fabricating ultimately strong polymeric or other composites. In their experiments, the team demonstrated significant mechanical reinforcement in polycarbonate/boron nitride composites and delicate tuning of nanosheet conductivity through modifying carbon contents. "When using the BN nanosheets as additives in polymers we found that they can improve the strength of polymers while keeping the transparency at the same time," says Wang. "In my experiments, the strength is increased by 20% while transparency is kept as 80%." Due to their unique physics and chemistry in energy, catalysis, superconductivity and electronics, 2D crystals – with graphene being the most popular material right now – are rapidly developing into one of the hottest research fields. Much of this research, though, is still focused on the synthesis of these new materials (see for instance "Graphene was only the beginning; now MAX phases get two-dimensional as well"). Novel high-yield fabrication techniques like 'chemical blowing' would result in the needed quantities that allows researchers to focus on exploiting the unique properties of these materials. "The difficulty in adopting our technique to new materials lies in finding the appropriate precursor for a 2D crystal, namely the materials composing the 'balloons'," says Wang. "When the walls of "balloons" are blown into atomic thickness, the materials should keep their shape while not bursting. This is a problem we need to solve for additional materials."